This paper explores the temporal organisation of laundry. It considers coordination in two forms: the scheduling of inter-connected practices (e.g. work, eating, other water-using practices) and of practitioners (for quality time, social occasions, and to align personal schedules). In both cases, the materiality of the practice – household infrastructure, the environment and, above all else, the washing basket – plays a critical coordinating role in laundry sequencing. Alongside detailed variations in laundry practices, there are collective social rhythms in play. The majority of washing machines ‘spin’ between 7-11am while most dryers ‘tumble’ in the late afternoon. 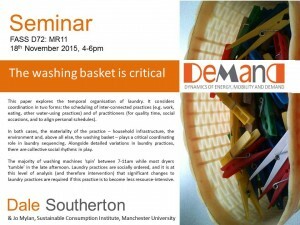 Laundry practices are socially ordered, and it is at this level of analysis (and therefore intervention) that significant changes to laundry practices are required if this practice is to become less resource-intensive. Dale Southerton and Jo Mylan are from the Sustainable Consumption Institute, Manchester University.